LONDON–(BUSINESS WIRE)–The partnership between the leading European card payments provider myPOS and the Belgian market leader in electronic payments Bancontact Payconiq Company has reached new heights, myPOS founder and entrepreneur Christo Georgiev has announced. All myPOS clients can now accept online payments made with Bancontact cards through myPOS Online services such as PayButton, PayLink and myPOS Checkout. Bancontact Payconiq Company is the most popular electronic payments service in Belgium, responsible for the processing of electronic payments made through debit cards for goods purchased in shops, gas stations, vending machines and online. In March 2018 Bancontact Company merged with Payconiq Belgium – a provider of a mobile payment system – to form a new company under the name of Bancontact Payconiq Company. 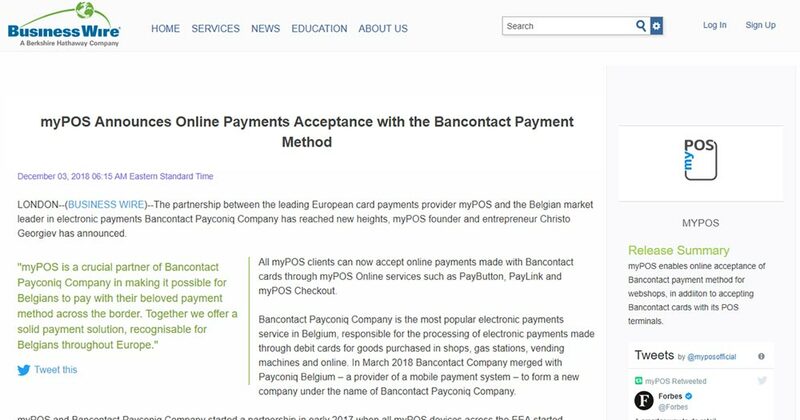 myPOS and Bancontact Payconiq Company started a partnership in early 2017 when all myPOS devices across the EEA started accepting payments made with Bancontact cards. This gave myPOS merchants in Belgium and traveling consumers across Europe the flexibility to receive and make payments using their favourite payment method, their Bancontact card. This increases myPOS merchants’ revenue stream while making clients who prefer to pay with their Bancontact card happy. 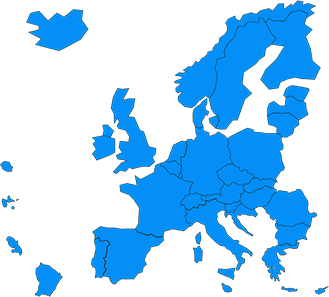 This partnership has been fruitful – in a month myPOS processes on average nearly 38 000 Bancontact payments in more than 20 different European countries with the service being most popular in Austria, Belgium, the Netherlands, Italy, Greece and France. The average transaction amount is EUR 69, which shows the trust customers have put in both myPOS and Bancontact Payconiq Company and demonstrates the size of the cooperation between the two companies. “We are very excited about our extended collaboration with myPOS, a crucial partner for Bancontact Payconiq Company to make it possible for Belgians to pay with their beloved payment method across the border. The fact that Belgians can pay with the Bancontact payment method at a foreign webshop increases the reliability and the clients’ trust. Together with myPOS we offer a solid payment solution, recognisable for Belgians throughout Europe.”, according to Nathalie Vandepeute, CEO of Bancontact Payconiq Company. myPOS founder Christo Georgiev said, “I am glad that the relationship between myPOS and Bancontact Payconiq Company is evolving. The addition of Bancontact as payment method to myPOS Online brings benefits both ways – myPOS offers better and more flexible services, while the Bancontact payment method enjoys popularity across Europe. In the end it is the consumers that win”. myPOS Europe Ltd is a licensed payments provider and processor, registered at 25 Canada Square, Level 33, Canary Wharf London E14 5LB, United Kingdom. The myPOS package includes a smart POS device, free myPOS account with business VISA card and access to additional merchant services. This entry was posted in Product News and tagged Bancontact, Payconiq. Bookmark the permalink.